Eden is a planet without a sun. Instead, light is generated by Eden’s humming trees and its strange animals. Scratching a living in one small area of the planet is a group of several hundred humans who are descended from two astronauts from Earth who settled on Eden approximately 160 years before. Five astronauts had landed but three left to try to make it back home. The remaining two, Tommy and Angela, stayed behind and in so doing became the mother and father, grandparents and great grandparents of every man, woman and child on Eden. Divided into different family groups, such as the Redlanterns, London and Brooklyn, the people wait for the astronauts to return and take them all back home to Earth. They have little but a shared mythology, a common memory handed down like Chinese whispers, to give them comfort. But as the years go by and no-one from earth has arrived, the youngsters, the New Hairs, led by John Redlantern, decide to turn an existence into a life. Dark Eden is one of the most extraordinary novels I’ve read in quite a while. Almost immediately, the powers of Beckett’s description and imagination have immersed the reader fully into this eerie, dark world which is both beautiful and menacing. Fierce leopards sing exquisitely before they strike, bats hang from trees with their arms folded, watching, bucks (like cattle) have lanterns growing on their heads. But the humans fare less well. Generations of inbreeding have created people with ‘batfaces’ and ‘clawfeet’. Many babies die, especially boys. Language has degenerated, adjectives have been lost – now something is ‘cold cold’ or ‘hot hot’ and life centres around the stories told by Eldest about Tommy and Angela, their journey from Earth and the objects they left behind, such as Car, Plane, Rayed Yo and Lecky-trickity. With such a blinkered outlook, with no ideas allowed to develop, the outlook for the Family is bleak. Dark Eden tells the story of what is nothing less than a revolution from a variety of perspectives, including that of John Redlantern, Tina Spikehair and other members of the Family and it’s an interesting mixed bunch of commentators. This allows us to see the full ramifications of what is happening and how the changes strike to the core of absolutely everyone. How they react to it and cope with it is extremely moving. The universe of Dark Eden is remarkable and its wonders are complemented by the language, which expands as our troop of New Hairs explore beyond the boundaries of what is known. The names of objects and creatures are literally fantastic. The whole concept, this new distant Eden with its many parallels to the biblical Eden, is gobsmacking. It raises a host of questions about faith and the answers aren’t necessarily pleasant. My admiration for Chris Beckett is enormous. 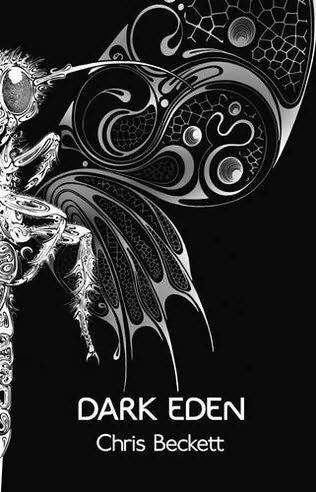 Dark Eden is a significant piece of science fiction. It is captivating but I also found it very disturbing. The fate of the characters and their lot in life troubled me. I was surprised by how involved I felt with these people and their drive for survival. Likewise with the story of the astronauts, which lies like a shadow across the novel. It will be interesting indeed to see where Chris Beckett will take us next. This entry was posted in Review, Sci Fi and tagged Science Fiction on January 18, 2012 by Kate (For Winter Nights). In which case I am super jealous as I’ll need to wait until it is released.